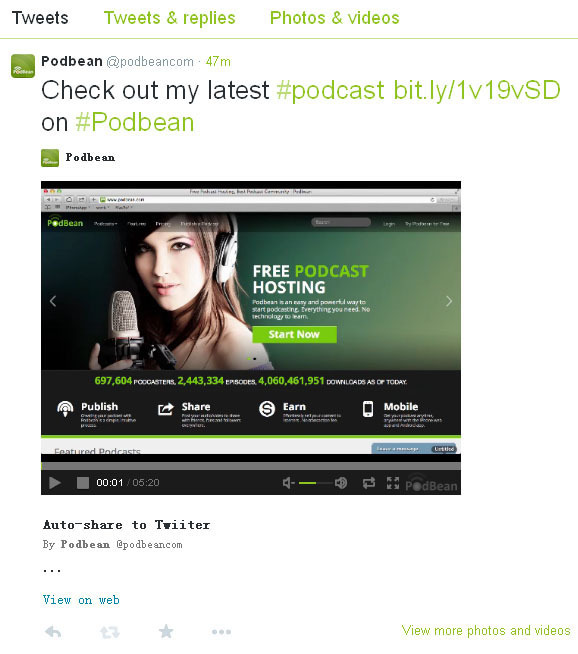 Podbean’s Twitter sharing capabilities just got better! Now, when you share to Twitter, your podcast player is embedded into your Tweet so users can play the episode directly. You can set up automatic sharing of each episode and you or any site visitors can click the “share” button to tweet an episode. With the new embedded player, you can really tap into the power of Twitter for greater exposure for your content. Podbean premium content allows you to charge users for content. For example, you might wish to create a bonus or special episode which users can download for a fee. This video tutorial shows you the easy steps to creating a premium single track. Learn more about creating premium contact by watching this quick how-to video. Podbean helps you get paid for podcast content with the option of premium content. You can create special premium content that users pay for and create a subscription option (or options). This tutorial video shows you how to create premium content and set up subscription plans for users to get paid content. There are different options, shown here, for the subscriptions. Podbean makes it simple to get the most out of your podcast, and we show you just how to do it! Podbean offers an advanced statistics platform that lets you easily see how your podcast is performing and get key data to make your podcast more successful. This video guides you through the Podbean podcast statistics platform, showing you the various statistics (such as plays, feed hits, most popular episodes) and graphs (such as geography, trends and client platforms) and describing what they mean to you. Take this video tour to better understand the great tools Podbean offers to help you succeed! the steps to setting up the Facebook app and more easily managing your podcast comments.